An Italian astronaut who experienced a harrowing near-drowning inside his spacesuit during a spacewalk outside of the International Space Station is telling his story. 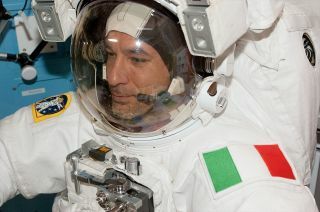 In a blog post last week, European Space Agency astronaut Luca Parmitano recounted the scary experience of feeling his spacesuit and helmet fill with water as he floated outside of the space station on July 16. He also described the experience in a video in his own words, saying he felt like being a "goldfish inside a fish bowl." "As I move back along my route towards the airlock, I become more and more certain that the water is increasing," Parmitano wrote in a post dated Aug. 20. "I feel it covering the sponge on my earphones and I wonder whether I’ll lose audio contact. The water has also almost completely covered the front of my visor, sticking to it and obscuring my vision." Italian astronaut Luca Parmitano of the European Space Agency (right) discusses what it felt like as water filled up his spacesuit during a harrowing spacewalk experience on July 16, 2013 in this still from an ESA video. Parmitano goes on to describe what sounds like a terrifying experience as he's attempting to get back into the airlock after NASA aborted the spacewalk. As he was making his way back inside the orbiting laboratory, he maneuvered himself vertically to clear an antenna and rewind his safety cable. "At that moment, as I turn 'upside-down,' two things happen: the sun sets, and my ability to see — already compromised by the water — completely vanishes, making my eyes useless; but worse than that, the water covers my nose — a really awful sensation that I make worse by my vain attempts to move the water by shaking my head," Parmitano wrote. "By now, the upper part of the helmet is full of water and I can’t even be sure that the next time I breathe I will fill my lungs with air and not liquid." Parmitano explained that at a certain point, he couldn't see much more than a few inches in front of him, making it exceedingly difficult to know where the airlock was located. Eventually, the spacewalker was able to use his safety cable as a guide, leading him toward the port. As Parmitano and Cassidy begin repressurization, the water filled the Italian astronaut's ears and he was no longer able to hear any instructions coming to him from his fellow space station resident, NASA's Karen Nyberg. "The minutes of repressurization crawl by and finally, with an unexpected wave of relief, I see the internal door open and the whole team assembled there ready to help," Parmitano wrote. "They pull me out and as quickly as possible, Karen unfastens my helmet and carefully lifts it over my head." Parmitano dried off and recovered from the ordeal, but space agency officials are still investigating the cause of the leak. NASA has appointed a review panel of experts to look into the issue and help make sure it doesn't happen again in the future. Parmitano has been posting photos of his space station mission online via Twitter and his blog posts. He is one of six members of the space station's Expedition 36 crew. The crew includes Parmitano, three Russian cosmonauts and two American astronauts.